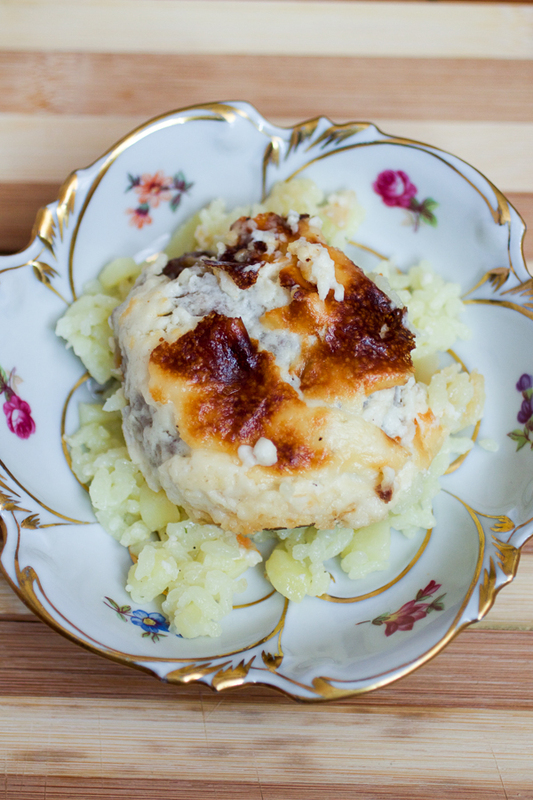 Ground beef patties with bechamel sauce recipe is exactly what you think it is: beef patties covered with delicious bechamel, and baked. The result will blow you away! 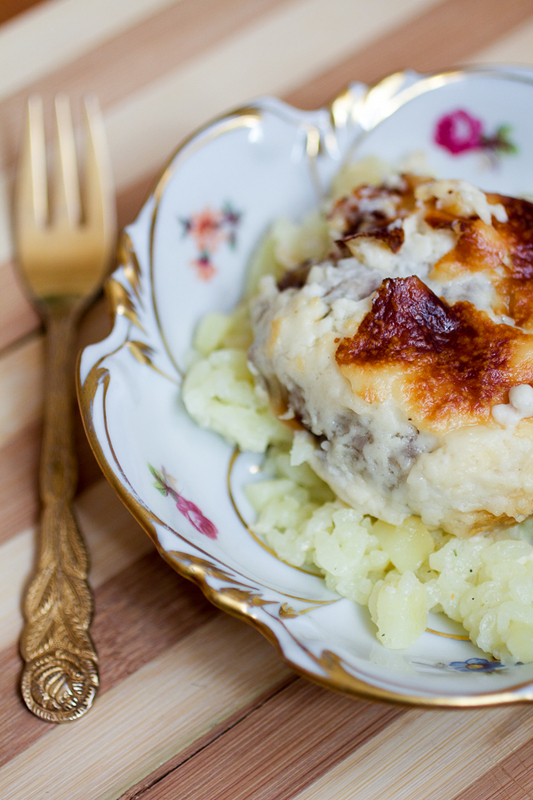 Today I’ll reveal a recipe – well it won’t be a huge revelation since you’ve already read the title of the post– but this ground beef patties with bechamel sauce recipe is one that falls into the something old becomes something new category. These two are soulmates – they make such sense together that I don’t know how I didn’t think of combining them before. To start with, hamburger (ground beef) patties are a glorious invention. They can be “sandwiched,” or eaten in a “schnitzel” form with some sides like rice or mashed potatoes, or even consumed alone just because. Meanwhile the bechamel sauce when made just right – and I’ll make sure you make it just right in as easy of a way as possible – is a comforting, warm, and filling kind of sauce. The idea of something old that becomes something new has been a theme in my life as of lately. Such as rediscovering my hometown. Recently, I started spending a lot of time in Sarajevo again. I moved to DC metro in 1995, just a few months before the siege of Sarajevo ended. Since then, I’ve been visiting once a year or so, just enough to get a taste of the city (and country) post-war, and appease nostalgia demons that attack all of us in the diaspora with a deep gnawing and a feeling of restlessness as soon as the first rays of spring arrive each year. For a while, it was enough to get a taste. But then this taste turned into a hunger. So after a series of excruciating life events, I decided to spend more time here. And it’s been very unusual. It’s Sarajevo, but it’s not Sarajevo. Imagine walking into your childhood bedroom and seeing it just the way you left it. But it’s not quite the same room. So you walk in and start touching all the pieces to try them out. Are they the same? Did you have that pillow before? Is that really your bed? And then you notice the new things. The windows are shaped differently. Walls are painted in a more serious color. Neighborhood’s changed. And spring rays that come through the window are more grown up, and are bringing along all the indications of how much time has passed. It’s winter here, and I had forgotten how cold winters in the Balkans can be. A new type of smog enveloped the city and got into the smallest pores. There were weeks at the beginning of the year you couldn’t go outside. It got so bad grocery stores passed out masks as if it were Japan, or Beijing. The windows stood useless as without a breeze all that came in through them were screams of street dogs and strong hints of smoke. This type of smog, this relentless, dirty pollution is a new phenomena. There was smog before in the 80s and 90s, but this has become dangerous. As most things go in the Balkans nowadays, the root of the problem stems from corruption and poor planning. Sarajevo (and most of Bosnia), is warmed up on gas. And the gas comes to the country from the Russians. They have not raised the prices for the past twenty-ish years. However, Bosnian politicians – and Bosnian politician is the type of a politician that will find any and every possible way to undermine the same people that voted them in – tacked on so many taxes on the gas bill that it becomes a mission impossible to afford it. The average salary in Bosnia is about $450/ month, and the gas prices can go up to $100/ month. And people have to warm up. So they burn all kinds of crap to stay warm. For days I sat inside, and I had contracted a sore throat and another bug – my body’s answer to all the changes – thinking of why I thought this city glorious. Looking outside there was nothing but a gruesome fog, the kind you encounter deep in English woods. So disgusting and dirty that the windows had amassed a film of dark greasiness as if it belonged on a train from the century that was previous to the century before. But then (days and days and days after the smog started), there came a day when the sun accompanied with a little bit of wind, blew all of it away. One can finally see the mountains around Sarajevo again, and little houses with crimson roofs – one on top of the other – and thin, winding roads descending into the city. A mosque here. A church there. Then a school. Then finally the main streets. I got my city back, my something old that’s become something new. My memories are getting familiar with the new way things are. And I remember why I was so in love with Sarajevo in the first place. There are the colors, vibrant and fresh, of faces on the street. There are cafés, lining up the streets, getting into even the smallest of places. There are the people, lovely, creative, improvising life into perfection. Then there are the old buildings, standing just where they stood, where they should always stand. And new ones. Kitschy, blasting their lack of taste into the space with such enthusiasm and brazenness that one by one they’re accepted. And then there is the food. The food that’s always been great. The food that’s adapted elegantly into today. The food with such reputation people still spend time preparing it in the kitchen every day. And going to the market, to find just the right carrot, potato or pepper. The food that’s fit with the new crowd just fine. There is space for these right next to McDonald’s patties. Smog or sunny days, good food persists. A cuisine that turns something old into something new without missing a beat. Or taste. Dice yellow onion, mince garlic, peel and grate the potato. Add to the meat and mix. Beat an egg and mix separately, then add to the meat as well. Finally, add the flour, seasoned salt and pepper, then mix everything thoroughly. 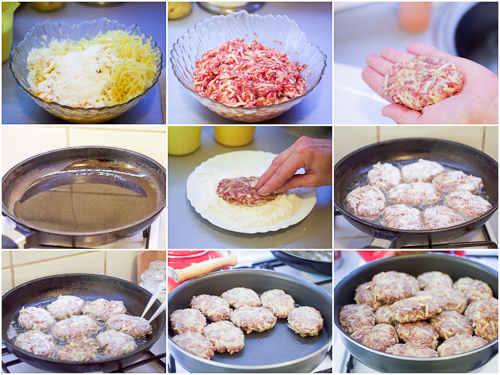 Shape the mixture into patties. (You should have about 15-16.) Pour some flour onto a plate and leave aside. Heat oven to 425°F. Bring the stove temperature to low, and then add butter to the oil in which the patties were fried. When the butter melts, start adding the flour in carefully, all the while mixing it in with the butter vigorously. You want to achieve a smooth sauce without flour crumbs in it. After flour and butter are combined together, add the heavy cream in very slowly while mixing the sauce all the while to avoid crumbling. Add the milk in while continuing to mix everything together. Finally, add the cheese in and continue stirring. Once it starts to boil (about 3-3.5 minutes) turn the heat off, and add the seasonings in. Pour the sauce over patties, and place pan in the oven and cover with foil. After 30 minutes, turn the pan around. Bake for another 15 minutes without foil. Serve with rice, polenta or mashed potatoes. Thank you for this recipe…I have looked for Balkan recipes featuring ground beef that aren’t in the “goulash” category. This recipe seems relatively easy, and your step-by-step photos are very helpful visuals. In time I will probably add a few touches of my own, but I am eager to make this dish and share it with my foodie friends for an International-themed dinner party! Thank you again! Chefette, welcome to the blog! Glad the recipe helped. 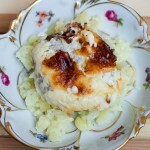 If you’re looking for more ground beef recipes, I’d recommend ground beef and potato pie (http://tinyurl.com/hgjweej). That’s if you can find phyllo at your grocery store. Please do add your own touches and if you get a chance, let me know how it turned out. I’m always curious to see what people do with the recipes. Your international themed dinner parties sound great!